Temporary Light Bulb Sockets for incandescent medium base bulbs. 660 Watts, 600 Volts. They come with a 4.5" pigtail leads. They are band new in individual packages. Create a temporary light system or replace your string sockets with our molded-rubber, water-resistant holders. 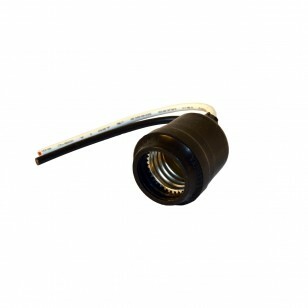 They have 4.5" 14-ga. wire leads and operate on a max of 600 VAC. Use with incandescent medium base bulbs.